Energy healing: Interventions that release energetic blockages, and repattern and balance the human biofield. Chakra or energy vortexes are responsible for the transformation of energy from one level to another and are repeated throughout the body. The First Chakra is the seat of the Physical Body. It is the Gonadic Center. The vibration of this center is red. It is the bone marrow within the bones. Bone marrow vibrates red. It is the vibration needed for cell replication and life. The Second Chakra is the Emotional Body. It is the Lymphatic Center. The vibration of this center is orange. This is where our first emotions are processed. It is the vibration needed for building bone. The bones in your body vibrate orange. The Third Chakra is the Mental Body. It is the Adrenal or Splenic Center. The vibration of this center is yellow. This is where your opinions and judgments form. The covering of the bone, or periosteum, vibrates yellow. The Fourth Chakra is the Astral Body or Heart Center. It is the Thymic Center. The vibration of this center is green. This is the first level beyond the three-dimensional world. This is the level of consciousness that bridges the physical and spiritual worlds. All the muscles in the body vibrate green. The Fifth Chakra is the Etheric Body. It is the Thyroid Center. The vibration of this center is blue. This is the physical of the spiritual body. The Etheric Body is the energetic template for the physical body. It is the "light body" that underlies our physical form. The fascia through out the body vibrates blue. The Sixth Chakra is the Celestial Body or "Third Eye". It is the Pineal Center. The vibration of this center is purple or violet. It is the Celestial Body that holds our individual future and is our access to the future. The skin on the body vibrates purple. The Seventh Chakra is the Ketheric Body or "Crown" Chakra. It is the Pituitary Center. The vibration of this center is white. The Ketheric Body is our place of emergence with God, the Oneness, the All. If the entire energy system is working normally, every pour in the body vibrates white light. This system is redundant through out the body. Every cell in the body has seven Chakras. All the organs have seven Chakras. 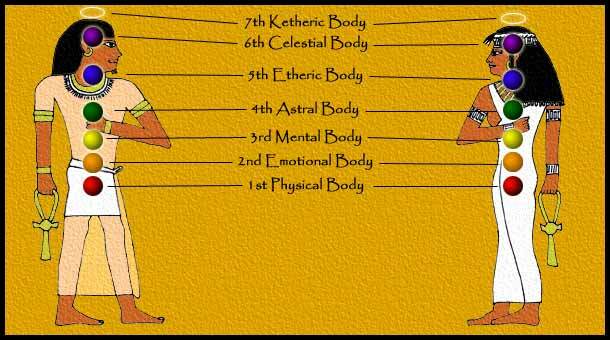 The seven Chakra system repeats itself in the hands, the feet, the neck, the ribs, the face, and throughout the entire body.